Satellite image courtesy of Prof. Andreas Muenchow, University of Delaware. The biggest block of arctic freshwater ice since 1962 has broken off Petermann glacier, in Greenland. 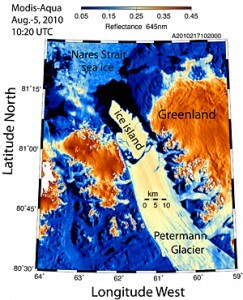 Andreas Muenchow, a researcher from University of Delaware, reported that an “ice island” four times the size of Manhattan was born in the early morning hours of 5 August 2010. The huge block, with a surface of at least 100 square miles (260 square kilometers) and a thickness up to half the height of the Empire State Building (reaching 443m high with its antenna), is now afloat in the high latitude waters off Greenland’s North-western coast. Satellite imagery of this remote area, about 620 miles (1,000 km) south of the North Pole, reveals that Petermann Glacier lost a staggering one-quarter of its 43-mile long (70 km) floating ice-shelf. Petermann Glacier is one of the two largest remaining glaciers in Greenland that terminate in floating shelves. The glacier connects the great Greenland ice sheet directly with the ocean. 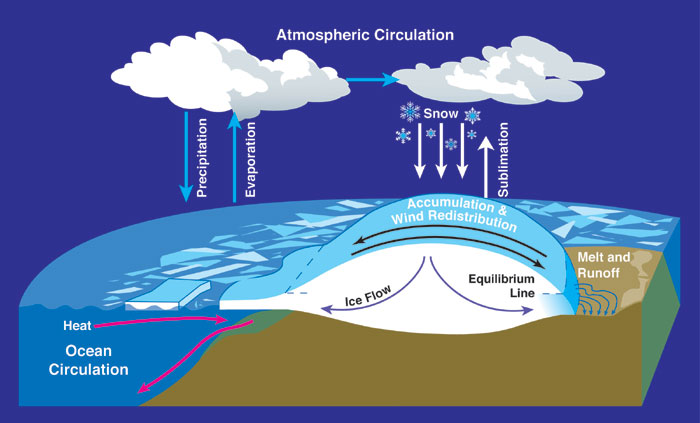 Whilst the melting of saltwater ice from arctic seas does not pose a problem in terms of rising sea levels (the resulting water “fills” the volume previously displaced by the floating ice), melted freshwater ice does, because it adds up new volumes previously “locked” on land. The increasing trend of receding glaciers and forming of ever bigger freshwater icebergs (which end up melting in their slow drift to warmer waters) are among the clearest signs that the evident, quick climate change our planet is experiencing points in the direction of higher global temperatures. The consequences of melting freshwater ice are multiple and very worrisome. First, melted ice from glaciers releases new volume of water to the seas. There is a geological, natural balance in this, as snow falling from previously evaporated sea water can be locked once again on land for thousands of years, adding new ice to existing glaciers. This natural cycle has varied through Earth’s history, as Ice Ages alternated to warm periods, causing rises and falls in the ocean levels through the millennia, thus radically (but very slowly) changing the looks of Earth’s geography over time. What we are witnessing in modern times thou is extremely rapid and unprecedented, as the amount of ice flowing into the oceans now appears to be outpacing the buildup of snow inland. 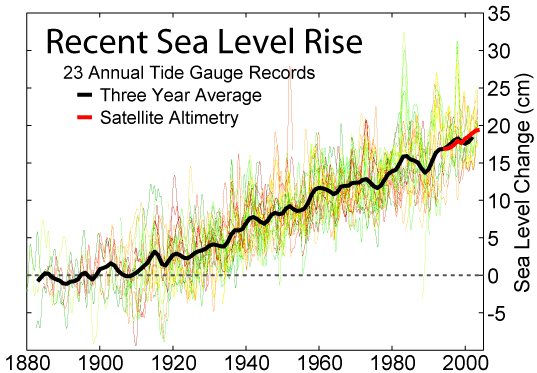 The oceans have already risen an estimated 20cm in the last 100 years, but the pace is now accelerating (with our extensive use of fossil fuels burnt in power plants blamed as the main cause for this trend). The immediate effect of rising seawaters is the flooding and destruction of low-rise coastal areas around the World, where most of human communities are located. 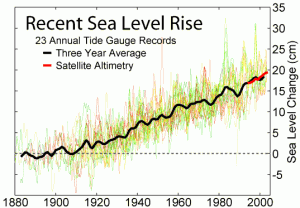 Recent changes in sea level. Source: Wikipedia. Secondly, melted freshwater flowing to the seas reduces the amount of existing freshwater reserves readily available for potable use to humans: only 3% of water on Earth is freshwater. Other consequences of the accelereated melting of freshwaters lie in the disruption to marine currents, with unpredictable climate effects (the most important one being studied, the alteration and interruption of the Gulf Stream that keeps the UK warm despite its high latitudes). A rapid alteration to local habitats is also among the clearest consequences, affecting animal and human life at a more local scale. Greenland, the world’s largest island, is almost entirely covered by a massive ice sheet that is roughly the size of Mexico (700,000 square miles), is up to two miles thick, and contains nearly a tenth of the world’s fresh water supply. If this ice sheet were to melt completely, sea levels would rise by over 20 feet (6 metres). Even a 3-foot (90cm) increase in sea levels would threaten some 70 million people living in coastal zones around the world. The Commitee Chairman, US Representative Edward J. Markey, commented on the fact suggesting the ice island is plenty big enough for people he calls “global warming deniers” to start their own country. Links to articles: University of Delaware, The Guardian, The Washington Post. This entry was posted in Clean Energy, Environment, Fossil Energy, Water. Bookmark the permalink.